I didn’t think it was possible to like Aaron Judge more than I already do, but after Saturday’s embarrassing loss to the Orioles, the face of the Yankees criticized his team’s effort. Every single game is important. Every single game is important! EVERY SINGLE GAME IS IMPORTANT! It’s the first time I have heard a player show real urgency this early in the season, as if the team finally realized there’s no extra credit given in the standings for wins after the All-Star break. Losses on March 30 are just as destructive to a team’s chance at winning the division and avoiding the one-game playoff as a loss in Game 161, and I was ecstatic to hear Judge has the same perspective on early-season games I have always believed in. Getting upset with the lineup construction in the first game of the season or being bothered by the bullpen usage in the third game of the season is entirely acceptable. When you play in the same division as one of the only other true powers in the entire league, you can’t afford to give games away, let alone give them away to an Orioles team expected to be one of the worst teams in the history of Major League Baseball. But that’s exactly what the Yankees did on Saturday and Sunday. An inability to hit with runners in scoring position, defensive mistakes and miscues, a lineup built with no logic and bullpen management without a plan cost them two games against an inferior opponent. These three games might have been the first three games of the 2019 season, but they felt like Games 163, 164 and 165 of the 2018 season. Last season, the Yankees went 23-14 against last-place teams, which is what the Orioles will end up being this season. The Red Sox went 32-5. The difference there is nine games. The Yankees lost the division by eight games. The Yankees’ being unable to beat the teams they should beat cost them the division, pushed them into the wild-card game, forced them to use Luis Severino in the wild-card game rather than Game 1 of the ALDS and gave the Red Sox home-field advantage in the ALDS. If the Yankees win the division, the Red Sox have to use Chris Sale in the wild-card game rather than Game 1 of the ALDS and Games 1 and 2 of the ALDS are at Yankee Stadium. And oh yeah, maybe the Red Sox flat-out lose the wild-card game and the Yankees face the A’s in the division series. Sure, the Red Sox had a special team last season, a team which started out 17-2 and ended up with 108 wins before beating the Yankees, Astros and Dodgers in the postseason. But the Yankees, despite all their injuries and second-half slump, were good enough to hang with them for most of the regular season. The difference in setting up October was their play against the worst teams in the league. I didn’t think the Yankees’ losing ways against the league’s worst would continue into 2019. I thought the way the division unfolded last year, followed by the humiliation of being run out of their own stadium in the postseason, and ultimately, another year of experience for the young core would change the team’s overall approach to the season. With nine games against the Orioles and Tigers to open the season, I thought the Yankees would go at least 7-2, get off to a good start right out of the gate and maybe even run away and hide with the division the way the Red Sox did a year ago. Clearly, I was a fool for thinking so. I was foolish to think not having baseball for six months magically made these Yankees any different than the 2018 Yankees. They’re not. It’s the same exact team and without Luis Severino, Dellin Betances, CC Sabathia and Aaron Hicks right now, they’re worse than last year’s version. I was against bringing Brett Gardner back, but the Yankees signed him to a one-year deal before free agency could even breathe. OK, so he would be back as the team’s fourth outfielder and a veteran clubhouse presence, relegated to a reserve role on a team with true championship aspirations in what is really their first season in this window of opportunity to win. When he would play, I certainly didn’t think he would bat leadoff whether Aaron Hicks is out or not. Gardner hit like a catcher last season, batting .236/.322/.368 and batting himself down to ninth in the lineup before batting himself out of the starting lineup compltely following the trade for Andrew McCutchen. Luke Voit bats fourth because of what he did last season. Miguel Andujar bats fifth because of what he did last season. Gary Sanchez bats sixth because of what he did last season (which is why he no longer bats third or fourth). Gardner bats first because … I have no idea. The Yankees are an analytics-driven team, which has set pitch limits and innings for pitchers, rules about set days off and who rests and when. They have sleep researchers determine when the team should arrive for road trips and what time players should wake up to work out. But when it comes to who should get the most at-bats on the team, they’re fine with a player who’s barely on the team getting them and they’re fine with having no reason to justify it either. 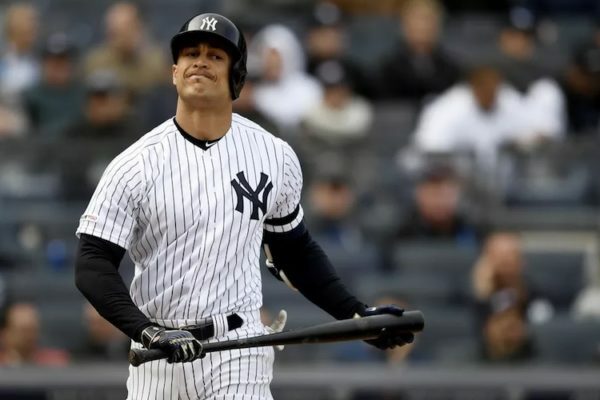 I thought Giancarlo Stanton would be more comfortable in his second season as a Yankee, and maybe, just maybe he might even change his approach at the plate after the way he looked against quality pitchers all of last season. I thought his second season in New York, having become more familiar with the pitchers in the league would be more enjoyable to watch than his first. But his at-bat with the bases loaded on Saturday, followed by his awful three-pitch at-bat on Sunday showed Stanton is the same old Stanton, a player who will put a game that’s out of reach farther out of reach and who will take your backend starters to the upper deck. We’ll continue to hear about his 120 mph singles breaking Statcast records in the first inning of games and we’ll continue to watch him chase every slider in a crucial moments as well. I thought Aaron Boone would progress as a manager in his second season, especially following his October mistakes. But after seeing him inexplicably bring Stephen Tarpley into Sunday’s game immediately following his offense getting the deficit to one with six outs left to tie the game made me wonder. Sure enough, Tarpley gave up a two-run home run to push the deficit to three. Then when Boone decided to get Chad Green up in the ninth inning in what was now a three-run deficit with the bases loaded thanks to Tommy Kahnle confirming he’s nowhere near being his old self, I no longer had to wonder. Boone proved he’s just as lost in his second season as he was in his rookie season. Call these opinions overreactions or cite these the first three games of the season as three games out of 162 and the smallest of sample sizes. But they’re not. They’re exactly what we watched from the Yankees last season. You can reference the 1-4 start in the historical 1998 season or the 1-2 start against the Orioles to open the team’s last championship season in 2009 as reasons to not get overly upset with this past weekend. But these Yankees are definitely not the ’98 team and they’re far from being the ’09 club as well. For now, the 2019 Yankees are a continuation of the 2018 Yankees.